It took a lot of teamwork, skill and courage for the Indian team to overcome the odds and defeat a rampaging Maldives side. However, India had an element, which has been thoroughly missing in the whole Football Federation in Bangladesh. India had belief and this would prove to be the key ingredient in their recipe to success. 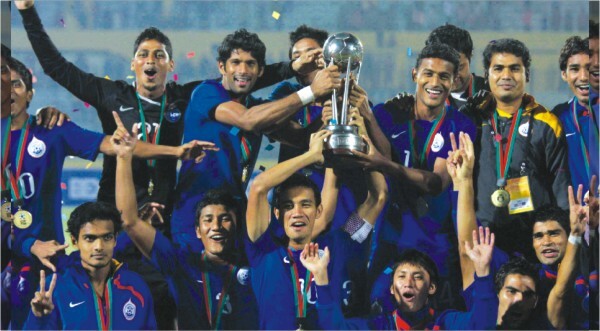 As the Indian side lifted the SAFF Championship Trophy above their heads many could be forgiven for forgetting that this was the Indian under-23s and not the actual national team boasting many stars. When Bob Houghton, India's National Team coach, decided to send the Under-23s instead of the current national team many eyebrows were raised. Though the media found the idea a satisfactory one, people within the organization felt that it was too big a risk to take. However, Bob proved them wrong and under the guidance of Under-23s coach Sukhwinder Singh, India crowned themselves regional champions in style. Of course many had written off India even before the tournament started and a loss against Maldives in the group stages, didn't boost India's confidence. When they had reached the semis against Bangladesh, many felt that it was time for a routing. However, Bangladesh failed to find the target and the young lads from India completely outplayed their more illustrious opponents. The finals against Maldives would prove to be an even-sided match, even though Maldives displayed more creativity in the midfield. However, they failed to create a single chance and India took hold of the game in the middle as well, but they too couldn't create anything of substance as well. Extra time came and went and then it was time for penalties. Arindam Bhattacharya, I-league's best goalkeeper transformed into a goalkeeper of World Class standard as he denied two Maldives spot kicks during the shootout. India capitalized and the result stood 3-1. The lads had grown up to be men and this victory will surely usher in a golden era for Indian Football. On the other hand India's neighbours, Bangladesh find themselves back where they started. BFF must be most shocked with the outcome of the tournament. Bangladesh stood out as complete opposites to the youthful and confident Indian side. The Hosts decided to play a widely experienced and aging side, applying age old tactics and brute strength at times. India solely depended on a very young side who showed off their skill, expertise in possession football, agility and flair to their advantage. Whereas Bangladesh stood as favourites, India were shunned as the underdogs. When David met Goliath, India came out 1-0 victors, owing to some superb play and partly due to Bangladesh's dismal showing. Now, perhaps many should begin wondering if Dido was going the right way by advocating youth policy, something India have done ever so successfully. If people had thought that Bangladesh football had progressed, well, this was the shock awakening needed. Not only must we now change our strategy but we must now look directly at the future, build for the future and aim for the future. And somebody please spare us from Cowboy Shantoo complaining about how his plan wasn't carried out and claiming that he has no idea why Bangladesh played the way they did. Some coach. Good job BFF. In the world of Premier League, talent is often obscured by star-power. 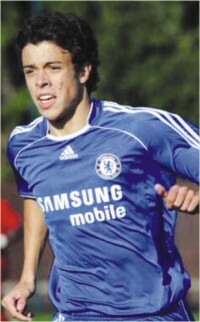 Such is the case with the shy Argentinean called Franco Di Santo. The 20-year old caught the eyes of teams such as Real Madrid and Manchester United, after scoring 13 goals in 66 league appearances for the Chilean team, Audax Italiano in the 2006-07 season. Considering that he was only 17 then, he quickly turned into football's hottest prospects. On 25 January 2008, he was snapped up by Chelsea, who had managed to beat off competition from both Real and United. Di Santo didn't take much time to acclimatize, making a major impact in the reserves team where he scored 8 goals in 7 appearances. He also scored a hat trick against Tottenham's reserve team, with one of those goals coming from a superb volley. With the likes of Drogba, Anelka and Kalou to fight with, it came as no surprise that the Reserve Graduate found it hard to find a place in the first team, yet he impressed on Chelsea's Pre-Season scoring goals and providing assists, a feat he would repeat in the 2009 pre-season. Santo made his full team debut in the 1-1 draw against Tottenham, replacing Anelka in the 88th minute. From then on he was constantly present on the bench and notched up 7 substitute appearances in the 08/09 season. With the signing of Daniel Sturridge, it was clear that Santo's chances would be further limited and thus he was loaned out to Blackburn Rovers. The 6 feet 4 inches striker found himself injured and thus out of manager Sam Allardyce's plan for a while but after a full game against Aston Villa, he was back in the first team, putting in increasingly impressive performances against Arsenal and Burnley. Already a part of the Rovers' folklore after scoring against Burnley and then assisting Dunn for the next one, the industrious striker is surely one for the future. However, the 20-year old still has much work to do. Though he can prove to be a constant menace for defenses and is always ready to provide an assist, he still has much room for development. With the African Nations Cup in January, he may be called back to Chelsea's squad to bolster their striking options; however this may not be the best idea as he has already settled in at Edwood Park. An interesting anecdote regarding Santo emerged when he once asked by Michael Ballack, 'Kid, what's your name?'. Without batting an eye-lid, the young one retorted, much to Ballack's delight, 'Franco Di Santo. And you? What's your name?' Santo has already endeared himself to fans and though he may have escaped career-damaging media attention; however he is already earmarked for the future as a superstar. Reminiscent of Hernan Crespo in his style of play, Santo has a long way to go and one that is full of glorious opportunities given his apparent potential.